Petroleum is an oily, flammable liquid with a specific odor. It is found in the sedimentary mantle of the earth and is a very important mineral resource. It is formed together with gaseous hydrocarbons, usually at depths in excess of 1.2–2.0 km. Near the surface of the earth, petroleum is transformed into thick maltha, semisolid asphalt, and so on. Petroleum consists of various hydrocarbons (alkanes, cycloalkanes, arenes [aromatic hydrocarbons], and their hybrids) and compounds containing heteroatoms (oxygen, sulfur, and nitrogen) in addition to carbon and hydrogen. Petroleum varies greatly in color (from light brown, almost colorless, to dark brown, almost black) and in density—from very light (0.65–0.70 g/cm3) to very heavy (0.98–1.05 g/cm3). Petroleum occurring in stratified deposits at considerable depths is saturated to varying degrees with gaseous hydrocarbons. Petroleum also varies in chemical composition. For this reason, the term “average” petroleum (that is, petroleum of average composition) is used only conventionally (see Figure 1). The elemental composition fluctuates the least: 82.5–87.0 percent C, 11.5–14.5 percent H, 0.05–0.35 percent O (rarely up to 0.7 percent O), 0.001–5.3 percent S, and 0.001–1.8 percent N. Low-sulfur oils (less than 0.5 percent S) are predominant, but about one-third of world petroleum production contains more than 1 percent S.
The world’s explored oil reserves (excluding socialist countries) were estimated in early 1973 at 71.2 billion tons (data on petroleum reserves published abroad may be underestimated). 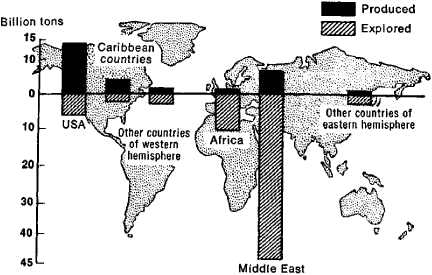 petroleum reserves are very unevenly distributed among the world’s countries and regions (see Figure 2). World oil production is doubling about every ten years. It was about 280 million tons in 1938, about 550 million tons in 1950, more than 1 billion tons in 1960, and more than 2 billion tons in 1970. In 1973, world oil production exceeded 2.8 billion tons. Production in the USSR was 31.1 million tons in 1940 and 429 million tons in 1973. From the beginning of industrial production (late 1850’s) to late 1973, world production of oil was 41 billion tons; half of this amount was produced between 1965 and 1973.
total energy consumption (1972); in the Common Market countries, more than 60 percent (1972); and in Japan, 70 percent (1972). In the USSR petroleum accounted for 42.3 percent of total fuel production in 1972 (in terms of standard fuel). The rapid growth of liquid fuel consumption in the developed capitalist countries (USA, Western European countries, Japan, Canada, and Australia), which account for more than four-fifths of world petroleum product consumption (excluding socialist countries) but only about 10 percent of explored reserves and about 30 percent of production, has enlarged the geographical gap between petroleum-producing and petroleum-consuming regions (see Figure 3). 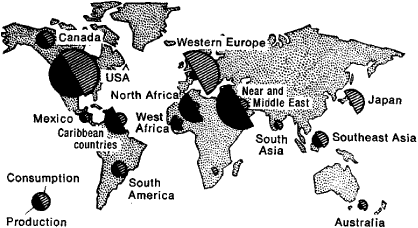 The rapid growth of petroleum production in the developing countries (particularly in the Middle East) to meet the mounting industrial and military-strategic needs of the developed capitalist countries, exerts a decisive influence on the petroleum industry of the capitalist world (see). Several periods in the study of the genetic nature of petroleum and the conditions of its formation may be distinguished. The first period (prescientific) lasted until the Middle Ages. In 1546, Agricola wrote that oil and hard coal are of inorganic origin; however, hard coal is formed by the thickening and hardening of oil. The second period, that of scientific guesses, is associated with the publication of M. V. Lomonosov’s work On the Layers of the Earth (1763), in which he expressed the idea of the distillation origin of oil from the same organic substance that gives rise to hard coal. The third period in the evolution of knowledge about the origin of oil is associated with the rise and development of the petroleum industry. Various hypotheses of the inorganic (mineral) and organic origin of oil were advanced during this period. In 1866 the French chemist M. Berthelot expressed the supposition that oil is formed within the earth under the action of carbonic acid on alkali metals. In 1871 the French chemist H. Byasson suggested that oil originates by means of the interaction of water, CO2, and H2S with red-hot iron. 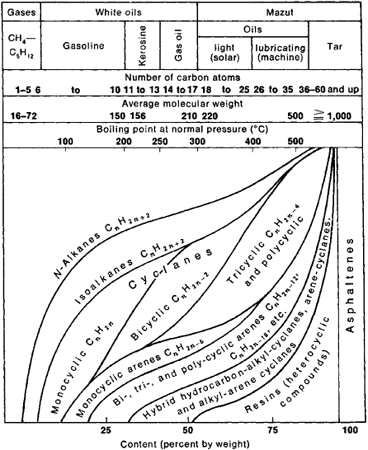 In 1877, D. I. Mendeleev proposed the mineral (carbide) hypothesis, which states that the origin of oil is associated with the penetration of water through fractures deep into the earth, where hydrocarbons and ferric oxide are formed under the action of the water on “carbon metals” (carbides). In 1889, V. D. Sokolov set forth the hypothesis of the cosmic origin of oil, according to which the hydrocarbons contained in the earth’s gaseous envelope when the earth was still molten were the raw material for the origin of oil. The hydrocarbons were absorbed by the molten magma as the earth cooled. Later, with the formation of the earth’s crust, the hydrocarbons penetrated the sedimentary rocks in a gaseous state, condensed, and formed petroleum. In the 1950’s and 1960’s various hypotheses of the inorganic (cosmic, volcanic, and magmatogenic) origin of petroleum were revived in the USSR by N. A. Kudriavtsev, V. B. Porfir’ev, and G. N. Dolenko and abroad by the English scientist F. Hoyle. However, the inorganic hypotheses did not receive support at the sixth, seventh, and eighth world petroleum congresses (1963, 1967, and 1971, respectively). The establishment of the optical activity of petroleum and of the close relation between petroleum and organic sapropelic matter in sedimentary rock (late 19th and early 20th centuries) was important for the knowledge of the genesis of petroleum. The sapropel hypothesis, first put forth by the German botanist H. Potonié in 1904–05, was subsequently developed by the Russian and Soviet scientists N. I. Andrusov, V. I. Vernadskii, I. M. Gubkin, and N. D. Zelinskii. The sapropel hypothesis has been assimilated by the modern sedimentary-migration theory of petroleum origin. Contributions to the development of the concepts concerning the nature of petroleum and the conditions of deposit formation were also made by the works of the German scientist C. Engler; the American geologists J. Newberry, E. Orton, and D. White; and the Russian and Soviet scientists G. P. Mikhailovskii, D. V. Golubiatnikov, M. V. Abramovich, and K. I. Bogdanovich. The fourth period is characterized by the organization of extensive geological and geochemical research to solve the problem of petroleum formation and the problem of oil-source deposits, which is organically associated with it. In the USSR such work was done by A. D. Arkhangel’skii in 1925–26. In the USA, similar research was begun by P. Trask in 1926. I. M. Gubkin’s classic work The Theory of Petroleum, which played an extremely important role in the development of ideas on the origin of oil and the formation of oil deposits, was published in 1932. Porphyrins, which form the molecule of chlorophyll and other natural pigments, were discovered in petroleum, asphalt, and fossil coals in 1934. The beginning of the fifth period is associated with the discovery in the 1950’s, by A. I. Gorskaia in the USSR and P. Smith in the USA, of petroleum hydrocarbons in the sediments of various types of bodies of water (lakes, gulfs, seas, and oceans). Contributions to subsequent progress in this area were made by numerous scientists and research groups in various countries: A. D. Arkhangel’skii, I. M. Gubkin, N. M. Strakhov, A. A. Trofimuk, V. I. Vernadskii, A. P. Vinogradov, A. M. Akram-khodzhaev, I. O. Brod, A. F. Dobrianskii, N. A. Eremenko, A. E. Kontorovich, M. F. Mirchink, S. N. Neruchev, K. F. Rodionova, V. A. Sokolov, V. A. Uspenskii, N. B. Vassoevich, and V. V. Veber, in the USSR; F. M. Van Teil, K. Sobell, W. Mein-schein, A. Levorsen, G. Smith, P. Smith, J. Hunt, H. Hedberg, E. Evans, P. Abelson, and J. Erdman in the USA; B. Tissot in France; R. Meinhold and P. Müller in the German Democratic Republic; and M. Teichmüller and D. Welte, in the Federal Republic of Gemany; and also by scientists in Japan and Great Britain. Persuasive evidence of the biogenic nature of the source of oil was obtained by detailed analysis of the evolution of the molecular composition of hydrocarbons and their biochemical progenitors in parent organisms, in the organic matter of sediments and rock, and in various types of petroleum from oil deposits. Of importance was the discovery in petroleum of chemical fossils, very distinctive, often intricately constructed molecular structures clearly of a biogenic nature (that is, inherited—wholly or in the form of fragments—from organic matter). Study of the distribution of stable carbon isotopes (12C and l3C) in petroleum, the organic matter of rock, and organisms (A. P. Vinogradov and E. M. Galimov) also confirmed the incompetence of the inorganic hypotheses. It was established that petroleum is the result of lithogenesis. It is a basically liquid, hydrophobic phase of the products of the fossilization of organic matter (kerogen) in aqueous sedimentary deposits. Petroleum formation is a process that takes place in stages over a very long period (usually many millions of years). Among the stages are (1) the preliminary stage, during which petroleum (micropetroleum), which is diffusely scattered throughout the parent rock, is formed under the influence of biochemical and biocatalytic factors; (2) the main stage, when, as a result of bituminization, the bulk of the micropetroleum is generated, and it “ripens,” approaching the composition of petroleum proper, and migrates into reservoir rocks and through them into oil traps; and (3) the posterior stage, when there is an increase in the accumulation of low-molecular-weight hydrocarbons, usually bringing about the formation of gas condensate, a light gas-dissolved crude oil (the gases gradually become increasingly “dry”—that is, rich in CH4). 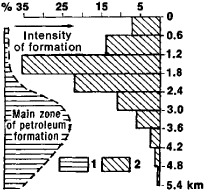 I. M. Gubkin also distinguished a stage of disintegration (breakdown) of petroleum deposits. to the zone where the organic matter in the rock reaches the degree of metamorphism characteristic of coal tar (T). The boundary lies at depths of 3.0–3.5 to 5–6 km, depending on the intensity and duration of heating (“depth” is understood to mean the maximum depth of subsidence during the entire geological history of a given series of sedimentary deposits). more, located in porous and permeable reservoir rock. There are three main types of reservoir rock: intergranular reservoirs (mainly aleurites and sandstones), cavernous reservoirs (for example, karst-cavern limestones and limestones of reef origin), and fissure reservoirs (carbonaceous, siliceous, and other fissured rocks). The oil pool usually lies beneath a caprock, which is composed of rock of low permeability. Each oil pool is located in an oil trap, which blocked the migrating oil and gas and retained them over a long period of time. There are three main types of oil traps: closed traps, semi-closed traps, and open traps. 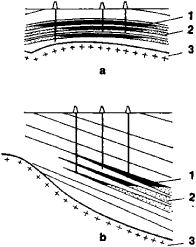 The first two types are associated with the primary pinching out (stratigraphic unconformity, or tectonic trapping) of reservoir rock (see Figure 5) and are therefore called pinching traps. 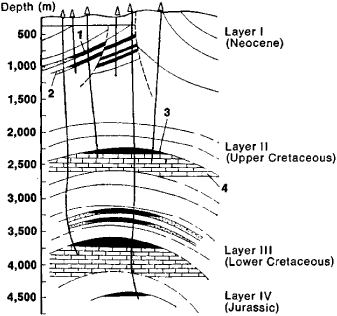 Open traps are hydraulic traps in which the oil and gas are confined in the vaulted part of the anticlinal bend of strata (this type is extremely widespread) or in a projection of the subsurface terrain (for example, a fossil reef). Gas (a “gas cap”) sometimes occupies the highest portion of the trap; in this case it is known as a gas-oil deposit, and water lies below the oil. Petroleum is found at various depths, as far down as 6–7 km, although at depths of 4.5–5.0 km oil pools increasingly give way to gas and gas-condensate deposits. The greatest number of oil pools lies in the range from 0.5 to 3 km, and the greatest reserves are concentrated from 0.8 to 2.4 km. sedimentary basins, which are the “homeland” of petroleum, is of great importance in the division of land and water areas into geological oil and gas zones. The basins vary greatly in size (from several thousand to several million square kilometers, although about 80 percent of them have an area of 10,000 to 500,000 sq km). Altogether, there are about 350 such basins (excluding the small, mainly intermontane basins) in the present-day structure of the earth. Commercial oil and gas capacity has been established in 140 basins; the rest are promising. (about 35 percent), the platform-fold type, the foredeep type (about 15 percent), or the perioceanic platform type (about 15 percent). About 25 percent of all known petroleum reserves are confined to Cenozoic deposits; 55 percent, to Mesozoic deposits; and 20 percent, to Paleozoic deposits. Oil and gas regions, districts, and (or) zones, which are characterized by autonomy and shared structural features, are distinguished within oil and gas basins. Oil fields are the lowest basic units of regionalization (zonation). 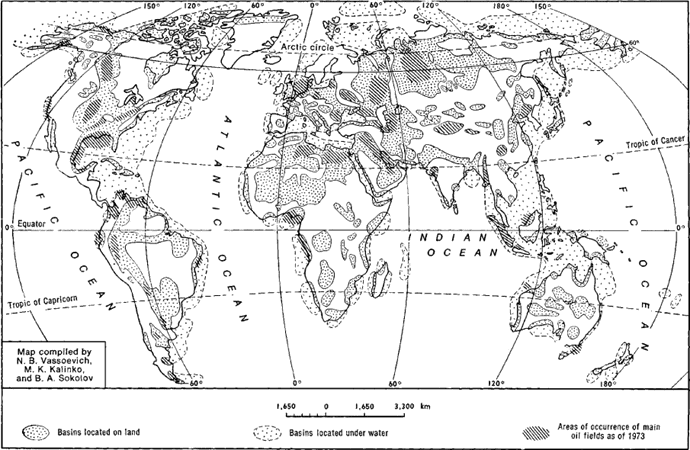 They are portions of the earth’s crust with an area of dozens, hundreds, and sometimes thousands of square kilometers, that have one or more oil pools in oil traps (see Figure 6). They are mainly areas where petroleum accumulates after lateral or sometimes vertical migration from the zones of oil formation. As of 1973, about 28,000 oil fields were known; 15–20 percent of them are solution gas drive fields. sixth of all fields have total geologic reserves of more than 3 million tons each (recoverable reserves are usually about one-quarter to one-half of geologic reserves); of these, more than 400 are located in offshore zones. Five percent of the developed fields yield about 85 percent of world petroleum production; they included (in 1972) 27 superdeposits, each with initial recoverable reserves in excess of 500 million tons. Most of the deposits are in the Middle East. More than 20 percent of all explored oil reserves (excluding the socialist countries) are concentrated in only two of these, the Ghawar oil field (Saudi Arabia) and the Burgan oil field (Kuwait). Oil fields have been found on all continents (except Antarctica) and over a considerable part of the adjacent water areas (see Figure 7). In the USSR, deposits of petroleum were discovered in the 19th century on the Apsheron Peninsula (see Baku Oil and Gas Field), in the area of Groznyi, in Krasnodar Krai, on the Che-leken Peninsula, in the Timan-Pechora region, and on Sakhalin Island. On the eve of the Great Patriotic War (1941–45), and also after the war, deposits were discovered and developed in the Volga-Ural Oil-Gas Region; deposits were later developed in western Turkmenia, Kazakhstan (the Mangyshlak Oil and Gas Region), Stavropol’ Krai, the Ukraine, and Byelorussia. The Western Siberian Oil and Gas Basin, one of the largest in the world, in which significant oil fields are located, was discovered in the 1950’s and 1960’s (Table 1). Among the other socialist countries, there are a number of fields in Rumania and China, and also in Yugoslavia, Poland, and Hungary. Isolated small fields have been discovered in Bulgaria, the German Democratic Republic, and Mongolia. Among the developed capitalist countries and the developing countries, the largest fields have been discovered in the countries of the Middle East (Table 2). In the 1950’s and 1960’s large oil fields were also discovered in the countries of North and West Africa (Libya, Algeria, Nigeria, and Angola), in Australia, and in Southeast Asia (Indonesia and Brunei); fields with somewhat smaller reserves were found in India, Burma, Malaysia, and Japan (the smallest fields). There are more than 13,000 oil fields (mainly small) in the USA; the largest was discovered in Alaska (Prudhoe Bay), and the second largest in Texas (East Texas). Somewhat smaller fields exist in California (the California Oil-bearing Region), Oklahoma, and other states (the Gulf of Mexico Oil-Gas Basin). Large oil fields have been developed in Canada and Mexico. In South America, fields with large reserves have been discovered in Venezuela, the location of one of the largest superdeposits—the Bolivar field, which consists of a group of fields (Lagunillas, Bachaquero, and Tía Juana) along the northeastern shore of Lake Maracaibo (the Maracaibo Oil-Gas Basin). Isolated large fields exist in Argentina, Colombia, and Brazil and on the island of Trinidad and its adjacent water areas. In Western Europe, large fields have been discovered only in the waters of the North Sea (on the continental shelfs of Great Britain, Norway, and Denmark). The goal of petroleum exploration is the discovery, geological and economic analysis, and preparation for development of commercial oil and gas fields. Petroleum exploration is conducted by means of geological, geophysical, geochemical, and drilling operations performed in an efficient combination and sequence. Oil and gas geological exploratory work in the USSR is divided into two stages, prospecting and exploration. The prospecting stage consists of three phases: regional geological and geophysical work, preparation of areas for deep exploratory drilling, and searching for fields (prospecting). The exploratory stage is not divided into phases; it ends with the preparation of fields for development. In the first phase of the prospecting stage, regional work is conducted in basins with unestablished oil-bearing and gas-bearing capacity, to study either little known tectonic zones or lower structural stages in basins with established oil-bearing and gas-bearing capacity. Geological, aeromagnetic, and gravimetric surveys (1:1,000,000–1:1,200,000), geochemical analysis of waters and rock, profile traverses of the territory by electrical and seismic prospecting, and drilling of parametric and geological exploratory holes are performed for this purpose. As a result, potential productive deposit complexes and oil and gas zones are discovered, a quantitative forecast evaluation of oil-bearing and gas-bearing capacity is provided, and the most important regions for subsequent prospecting work are determined. In the second prospecting phase, the oil and gas zones are studied in more detail by means of geological-structural surveying, detailed gravimetric prospecting, electrical prospecting, seismic prospecting, and structure drilling. Structural (subsurface) and other types of maps with scales of 1:100,000–1:25,000 are compiled. Detailed studies of the structure of areas to be prepared for wildcat drilling are made by seismic surveying and structure drilling. Preference is given to seismic prospecting, which makes it possible to study the structure of the earth’s interior at great depths. In this phase the forecast evaluation of oil and gas capacity is made more precise, and prospective reserves are estimated for structures located in zones with proved oil and gas capacity. In the third prospecting phase, exploratory wells are drilled in order to discover deposits. 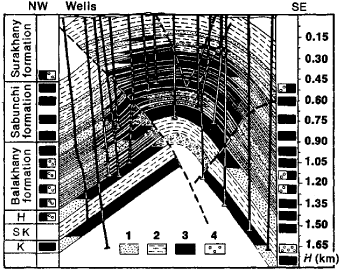 Exploratory (wildcat) wells are drilled in areas near the vaulted parts of anticlines, brachyan-ticlines, and domes (see Figure 8, a) or in regions of trap development (Figure 8, b). The first exploratory wells are usually drilled to the maximum depth in order to study the entire sedimentary rock series. The upper stage is usually explored first. A preliminary estimate of the reserves of newly discovered fields and recommendations on their subsequent exploration are obtained as a result of prospecting. The exploratory stage is the final stage in the geological prospecting process. The main purpose of the stage is to prepare the deposit for development. In the exploration process, oil pools must be mapped; the lithological composition, thickness, gas-oil saturation, and reservoir rock properties of the producing formations must be determined; changes in the parameters over the area must be studied; the physical and chemical properties of the oil, gas, and water must be analyzed; and the well production rate must be established. The number of development wells and the spacing between them depends on the type of structure being explored, and also on its size and the degree of heterogeneity of the oil- and gas-bearing rock. In the presence of several oil and gas beds, it is economically advantageous to perform the exploratory drilling in stages (see Figure 9). Recoverable pools isolated from one another by considerable depths are separated into stages. Upon completion of the exploratory work, the recoverable reserves are estimated and recommendations are made on bringing in the field. of efficiency of geological exploratory work (prospecting and exploration stages) is the cost of exploration per ton of petroleum (or cubic meter of gas). Other indicators of efficiency are the increase in reserves per meter of prospecting and exploratory wells drilled or per single well, and also the ratio of the number of producing wells to the total number of wells completed (by construction). In terms of most indicators, geological oil and gas prospecting efficiency is higher in the USSR than in the USA. Almost all the petroleum produced in the world is extracted through boreholes (wells) braced with high-pressure steel piping. To bring the oil and associated gas and water to the surface, wells have a sealed system of pipes, mechanisms, and shutoff fittings designed for operation at pressures commensurable with formation pressures. Before the introduction of well drilling, primitive methods were used to obtain oil: it was collected from the surface of bodies of water, from oil-impregnated sandstone or limestone, and from pits. The collection of oil from the surface of open bodies of water was apparently the first oil production method; it was used in Media, Babylonia, and Syria before the Common Era and in Sicily in the first century A.D. In Russia, oil was first collected from the surface of the Ukhta River by F. S. Priadunov in 1745. Oil was collected in lake-water drainage trenches on the Che-leken Peninsula in 1858 and in the Kokand Khanate in 1868. A dam made of planks, with a water outlet in the lower part, was built in the trench or channel, and the oil accumulated on the surface. The mining of oil-impregnated sandstone or limestone and the extraction of the oil from them were first described by the Italian scholar F. Ariosto in the 15th century. Not far from Modena in Italy, such oil-bearing soils were pulverized and heated in cauldrons. The oil was then squeezed out in sacks by means of a press. In 1819 in France, limestone and sandstone beds containing petroleum were mined by the shaft method using tunnels sometimes more than 1 km long. The extracted rock was placed in a vat filled with hot water. After mixing, the oil rose to the surface of the water and was collected with a ladle. From 1833 to 1845 oil-impregnated sands were mined on the shore of the Sea of Azov. The sands were placed in pits with a sloping bottom and were sprinkled with water. The oil was washed out of the sand and collected from the surface of the water by clusters of grass. Oil was recovered from shaft pits in Kissia (an ancient region between Assyria and Media) in the fifth century B .C. by means of a yoke to which a leather bucket was attached. The recovery of oil from wells on the Apsheron Peninsula has been known since the eighth century. There are written indications concerning the recovery of light crude oil from wells in Surakhany and heavy crude oil from wells in Balakhany in the tenth to 13th centuries. A detailed description of oil well recovery in Baku was provided by the German naturalist E. Kämpfer in the 17th century. The wells reached depths of 27 m, and their walls were lined with stone or braced with wood. A map of the Apsheron Peninsula, showing the oil wells, was compiled in 1729. In Baku, 4,126 tons of oil were recovered from 120 wells in 1825, and 5,480 tons came from 220 wells in 1862. Recovery of petroleum by means of boreholes came into widespread use in the 1860’s. At first, oil was produced from wells by means of cylindrical buckets with a valve in the bottom or by bailers, as well as by collecting it in sump pits in the ground next to the wells. Deep-well pumping, a mechanized method for recovering oil, was first introduced in the USA in 1865 and was later used in the oil fields of Georgia (1874), Baku (1876), and Groznyi (1895). Compressor-lift oil production, which was proposed by V. G. Shukhov in 1886, was tested in Baku in 1897. Gas lift, an improved method of extracting oil from a well, was proposed by M. M. Tikhvinskii in 1914. The oil production process, from the seepage of oil through the producing formation into the bottom holes of the wells to the external pumping of the separator oil from the field, may be divided into three stages. The first stage is the movement of the oil through the formation to the wells, which takes place as a result of the artificially created pressure difference between the formation and the bottom holes of the wells (oil field or pool development). The second stage is the movement of the oil from the bottom holes of the wells to the wellheads on the surface (oil well recovery operation). The third stage includes the collection of the oil (and the accompanying gas and water) on the surface, their separation, removal of the water and mineral salts from the oil (oil preparation), treatment of the formation water before its reinjection into the formation during water flooding or for disposal in the field sewage system (water treatment), pumping of the water into the formation through injection wells, and the collection of casinghead gas. Oil production by means of wells and production installations and equipment is called oil field recovery operation. Oil field development. Oil field development refers to the process of moving the liquids (oil and water) and gas in the formations to the producing wells. Control of the process of movement of liquid and gas is accomplished by the placement of oil, injection, and control wells in the field, by the number of wells and the sequence in which they are brought into production, by the well operating conditions, and by the field energy balance. The development system adopted for a specific field determines the technical and economic factors—the yield and its change over time, the recovery factor, capital investments, and net production costs. The development system is designed and planned before the oil pool is drilled out. The conditions under which the field recovery operations will take place are determined during planning of the development on the basis of exploratory and test operation data. Such conditions include the geological structure of the oil pool, the reservoir characteristics of the rocks (porosity, permeability, and degree of heterogeneity), the physical properties of the liquids and gases saturating the formation (viscosity, density, and solubility of the gases and solid hydrocarbons in the oil), the oil, water, and gas saturation of the rock, formation pressures, and the temperature. On the basis of these data, hydrodynamic calculations are used to establish the technical characteristics of the field recovery operation for various types of development systems and to make an economic evaluation of possible systems. Such technical and economic comparisons result in the selection of the most favorable development system. In most cases, modern development systems provide for the injection of water into formations (artificial waterflooding systems accounted for 75 percent of all production in the USSR in 1972). There are two main types of waterflooding—edge water-flooding, or marginal flooding (for relatively small fields), and various types of center-to-edge flooding (for average and large fields). Center-to-edge flooding systems, in which the oil pool is divided by injection wells into strips in which three or five rows of producing wells are located (depending on the bedding conditions), are the most common (see Figure 10). For more intensive recovery, pattern flooding is sometimes used; in this case, injection wells are located over the entire area of the formation. The spacing between wells is 400–800 m. Several dozen to several thousand producing wells may be drilled in a single field (depending on the size of the deposit). As of Jan. 1, 1974, the USSR had a total of 62,079 producing wells and 9,135 injection wells. The effect on a formation is intensified by an increase in the ratio between the number of producing wells and injection wells, and also by the creation in the formation of an injection water pressure considerably higher than the initial formation pressure, even as high as the rock pressure. Water-oil displacement is used successfully in oil-pool development for petroleum with a viscosity of 0.15–0.20 poise (0.015–0.02 newton-sec/m2) under formation conditions. With greater viscosities, the recovery factor is substantially lower, and the flow rate of water for the displacement of a unit volume of petroleum is increased. However, even at low viscosities, about half of the geological reserves of oil remains in the ground with water-oil displacement. Work is currently under way to increase the oil production of formations by improving the washing and displacement capabilities of injection water and by introducing various types of additives, such as surface-active agents, carbonic acid, and substances that increase the viscosity of the water, thus reducing the unfavorable ratio of the viscosity of the oil and of the fluid displacing it. An adverse viscosity ratio may also be changed by reducing the viscosity of the oil, which can be done by injecting heat-transfer agents (hot water or steam) into the formation. The use of heat on formations by creating a heat source within the formation, which was first proposed in the USSR in the 1930’s, is again coming to be used in the 1970’s. An oil production method combining waterflooding with intraformation combustion, maintained by pumping water-air mixtures into the formation, is regarded as highly promising. Theoretical and experimental research is under way (1974) to increase oil recovery by displacing the oil with solvents and systems that are simultaneously soluble in oil and water. High-pressure gas injection has been used successfully in a number of cases to boost oil recovery from deep-lying formations. Shallow-lying high-viscosity oil-saturated formations are sometimes developed by the shaft recovery method. Recovery operations. Oil is extracted from wells by natural flow under the influence of field energy or by means of one of several mechanized fluid-lifting methods. Flowing well production usually prevails in the initial stage of development, and the well is shifted to mechanized production as the natural flow weakens. The mechanized methods used are gas-lift (or airlift) and deep-well pumping (using sucker-rod pumps, deep-well electric centrifugal pumps, hydraulic reciprocating pumps, and screw-type pumps). In the USSR, wells using deep-well sucker-rod pumps account for 69.1 percent of all wells put into operation; 15 percent are flowing wells, 11.8 percent are wells with deep-well electric centrifugal pumps, and 3.7 percent are gas-lift wells (as of 1973). The well recovery methods currently under development are gas lift, which was considerably improved in the early 1970’s, and the deep-well electric centrifugal pump method, which makes possible the withdrawal of large quantities of fluid (oil and water) from wells. In the USA, 8 percent of the wells in operation are of the flowing type and 92 percent are mechanized (1972). In the oil fields of the Middle East, a large number of wells are operated by the flowing-well method. Oil field. An oil field is a technological complex consisting of wells, pipelines, and various types of installations used to extract oil and the accompanying gas. The entire well output, which consists of oil with casinghead gas (and usually also with formation water and, in certain cases, sand), is piped to a group measuring installation, where the quantity of oil coming from the well is measured and the percentage of water contained in the oil and the quantity of casinghead gas per ton of extracted oil (the gas-oil ratio) are determined. The daily yield of oil (in tons) and gas (in cubic meters) is calculated separately for each well on the basis of these measurements. Ten to 30 wells are usually tied into a group installation. The daily oil production varies widely at different oil fields and ranges up to tens of thousands of tons. An important stage in the oil production process is the separation of gas from oil, which is done in a gas trap. Such traps are grouped at one or more points in the oil field. Oil that has been rid of casinghead gas goes to field dehydration and desalting units, where the formation water is separated from the oil and the mineral salts are reduced to a residual salt content of not more than 50 mg per liter in the separator oil. The gas is shipped to consumers or to a natural-gasoline extraction plant for refining. The dehydration and desalting are performed by thermal, chemical, or electrical methods. A considerable quantity of salts is removed with the separated water during dehydration; however, additional dehydration, in which the oil is passed through a layer of fresh water, is sometimes required. The water removed from the oil is purified for subsequent injection into the formations or for disposal in the sewage system. The oil is also stabilized—that is, the most volatile hydrocarbon fractions are removed from it to reduce evaporation loss during shipment to the refineries. In the stabilization process, the oil is heated to 80°-120°C and the light hydrocarbons are separated and subsequently condensed. The unstable gasoline and gas produced in this process are sent to natural-gasoline extraction plants, which are usually located near the oil field. All three processes—dehydration, desalting, and stabilization —are combined in a complex oil preparation installation to reduce operating expenses and consumption of heating fuel. The process of imparting commercial quality to the oil is called preparation. The separator oil is accumulated in tanks and pumped from them to petroleum trunk pipelines or to railroad tank cars for shipment to a refinery. The basic flow system of oil field operation can be modified depending on the well production rate, the main recovery method, the pressure and temperature of the oil at the wellhead, the physicochemical properties of the oil, and the quantities of gas, water, and sand contained in the oil, as well as on natural and climatic conditions. Substantial additions to the ordinary oil field process flow system are involved with the use of the gas-lift recovery method, which requires the installation at the oil field of a gas-lift compressor unit with collection and distribution pipelines. A water-supply system with pumping stations is installed at fields that are to be developed by means of artificial flooding. Water is drawn from natural bodies of water by means of water intakes, or the field’s formation waste water is used (after purification); the latter method is predominant. In some cases, water is extracted from a water-bearing formation in an injection well and fed into a producing formation by means of a deep-well electric centrifugal pump. To remove mechanical impurities, microorganisms, ferric salts, hydrogen sulfide, and carbonic acid from the water to be injected into the formation, it is treated with reagents, left to settle, and passed through sand filters in a water-treatment unit. A group of pumping stations, which feed the water through water-distribution batteries (to measure and regulate the flow rate), is set up in the field to create a pressure head when pumping the water into the injection wells. Prevention of losses of light fractions is of great importance in an oil field; it is most efficiently done with an enclosed oil-collection system in the field, in which the oil does not come into contact with the atmosphere throughout its entire journey from the well until it is pumped out to the refinery (see Figure 11). Transportation of well products within a field, which is done through pipelines, is an important part of the oil production process. A separate pipeline leads from each well to a group measuring unit, from which the oil enters a gathering pipeline and then passes to installations for oil preparation and to the stock tanks of the oil field. Two intrafield oil transportation systems are used—gravity-flow and pressure systems. In gravity-flow systems, which are used at old oil fields, the oil is moved from the wells by locating the wellhead above the level of the group gathering station. In pressure systems, the wellhead pressure itself is sufficient to deliver the oil and gas to a central field gathering station, from which the oil is fed to stock tanks and the gas is shipped to consumers or to a refinery. Several pressure-type oil and gas gathering systems are used in oil fields of the USSR: the Baroian-Vezirov single-pipe system is widely used in Azerbaijan and Turkmenia, and the Giprovostokneft’ intrafield gathering and transportation system is used in the Siberian oil fields. In addition to the basic production-process equipment, oil fields also have industrial water and power supply systems, field sewage treatment plants (see Figure 12), maintenance facilities, and storage areas. Offshore oil fields are opened up for the development of petroleum deposits confined to the continental shelf. are group measuring installations, which automatically switch wells for measurement, perform the measurement, monitor the state of operation of the well, and provide blocking in the event of emergencies; automatic separation plants; separator-demulsifiers, which perform simultaneous gas and water separation; installations for treatment of casinghead gas and water and for gauging and delivery of separator oil; multiple pumping stations; and unitized automatic gas-driven compressors. The development of oil field construction is based on the adoption of plant production of separate transportable units of basic production-process equipment, delivery of the units to the oil fields, and their on-site assembly. This makes possible a severalfold increase in the rate of construction—and decrease in cost—of major production-process installations. Petroleum is a complex mixture of alkanes (paraffin or acyclic saturated hydrocarbons), several cyclanes (naphthenes) and aromatic hydrocarbons of various molecular weight, and also oxygen, sulfur, and nitrogen compounds. The hydrocarbon composition of oil varies in different deposits. The gasoline and kero-sine fractions of most petroleums in the USSR are characterized by a considerable alkane content (more than 50 percent). Naph-thene hydrocarbons (50–75 percent) are predominant in the fractions of some petroleums. The aromatic hydrocarbon content of most petroleums is 3–15 percent in gasoline fractions and 16–27 percent in kerosine fractions. Lubricating-oil distillates sometimes differ considerably in hydrocarbon composition. High-sulfur petroleum fractions have the highest aromatic hydrocarbon content (up to 53–65 percent in some cases). Petroleum is often characterized by a considerable content of solid hydrocarbons, consisting mainly of hydrocarbons of normal structure. Oxygen compounds are contained in petroleum in the form of naphthenic acids and asphalt-resin substances (which account for more than 90 percent of the oxygen in petroleum). The sulfur compounds include hydrogen sulfide, mercaptans, sulfides, disulfides, thiophenes, thiophanes, and polycyclic sulfur compounds of diverse structure. The nitrogen compounds are principally homologues of pyridine, hydropyridine, and hy-droquinoline. Dissolved gases (petroleum by-product gases), water, and mineral salts are also components of petroleum. The gases consist of hydrocarbons with one to four carbon atoms in the chain; their content ranges from tenths of a percent to 3 percent (by weight). The content of ash (mineral substances) in most petroleums does not exceed tenths of a percent (in terms of petroleum). Numerous elements (such as calcium, magnesium, iron, aluminum, silicon, vanadium, and sodium) are found in petroleum ash. Petroleum is divided into three groups according to density: light crude (with a density of up to 0.87 g/cm3), which accounts for about 60 percent of world oil production (66 percent in the USSR); medium (0.871–0.910 g/cm3), which accounts for about 28 percent in the USSR and 31 percent abroad; and heavy crude (more than 0.910 g/cm3), which accounts for about 6 percent in the USSR and 10 percent abroad. The initial boiling point of petroleum is usually above 28°C. The pour point ranges from + 30° to —60°C and depends mainly on the paraffin content (the more paraffin, the higher the pour point). The specific heat of petroleum is 1.7–2.1 kilojoules per (kg • °K), or 0.4–0.5 kcal/(kg • °C); heat of combustion, 43.7–46.2 megajoules per kg, or 10,400–11,000 kcal/kg; dielectric constant, 2.0–2.5; electric conductivity, 2 × 10 to 0.3 ×10–18ohm–18 .cm–1. The viscosity varies over a wide range (1.2–55.0 centistokes at 50°C) and depends on the chemical and fractional composition of the petroleum and on its tar content (content of asphalt-resin substances). The flash point of petroleum ranges from below —35° to 120°C, depending on the fractional composition and saturated vapor pressure. Petroleum is soluble in organic solvents and is virtually insoluble in water under ordinary conditions, although it can form stable emulsions with water. The technological classification of petroleum in the USSR (GOST [All-Union State Standard] 912–66) is based on (1) the sulfur content (class I—low-sulfur oils, containing up to 0.5 percent S; class II—sulfurous oils, with 0.5–2.0 percent S; class III—high-sulfur oils, containing more than 2 percent S); (2) the potential content of fractions that boil away below 350°C (type T1—oils in which the content of such fractions is not less than 45 percent; type T2—30 to 44.9 percent; type T3—less than 30 percent); (3) the potential content of lubricating oils (groups M1, M2, M3, and M4; for M1 the content of oils is not less than 25 percent, and for M4 less than 15 percent); (4) quality of the lubricating oils (subgroup Ii—petroleum with an oil viscosity index of more than 85; subgroup 12—petroleum with a viscosity index of 40–85); and (5) the paraffin content and possibility of producing jet fuels, summer or winter diesel fuels, and distillate oils with or without deparaffinization (type Pi—petroleum with a paraffin content not higher than 1.5 percent; type P2—petroleum with 1.51–6.0 percent paraffin content; and type P3—petroleum with a paraffin content of more than 6 percent). The combination of the class, type, group, subgroup, and type designations makes up the technological classification code. For example, Dossor (Kazakh SSSR) low-paraffin petroleum has the code number IT1M1I1P1—that is, low-sulfur petroleum with a potential content of fractions boiling away below 350°C of more than 45 percent, a potential lubricating-oil content of more than 25 percent, a lubricating-oil viscosity index of more than 85, and a paraffin content of less than 1.5 percent. The technological classification can be used to grade petroleum (during shipment to refineries for processing) and to record quality in planning production and refining, and also in designing new refineries. Abroad, petroleum is graded primarily according to density and sulfur content. In the Middle Ages references to oil are found among writers of the Middle East, Middle Asia, and Western Europe. In the 16th and 17th centuries petroleum was an item of trade. Commercial lists recorded the shipment of petroleum to Marseille from Languedoc (a maritime region of France), the Turkish city of Smyrna (Izmir), and the Syrian city of Aleppo (up to 4.5 tons per year). The first scientific works on petroleum appeared in the 18th century. In 1721 the Greek scholar Eirini d’Eirinis, who lived in France, published the results of his research on petroleum and asphalt. The state of the Baku oil field was described by Marco Polo in the 13th century. He indicated that the Baku oil was used for illumination and as a medicine for skin diseases. In the 16th and 17th centuries petroleum was brought from Baku to the central regions of Russia. It was used in medicine, in painting as a solvent for making paints, and in warfare for making grenades, candles that could not be extinguished by wind, and “luminous” cores for fireworks. Distillation of petroleum was known by the turn of the Common Era. This method of purification was used to reduce the unpleasant odor of petroleum for medicinal use. Petroleum was recommended in Russian and foreign books of home cures in the 15th to 17th centuries as an internal and external remedy. It was thought to be helpful in the treatment of inflammatory processes. The books of home cures also contain a description of a petroleum distillation method according to the experiments of the Roman physician Cassius Felix and the 11th-century Arab scholar Avicenna. The distillation of Baku petroleum was first mentioned by the 13th-century Khwarazmian geographer Bek-ran. A great deal of attention was devoted to the distillation of petroleum in the 18th century in connection with the search for and study of petroleum deposits. In 1748, petroleum found on the Ukhta River was distilled at the laboratory of the Berg-Kollegiia (Collegium of Mines) in Moscow. The same laboratory was used for the distillation of petroleum taken from the Soka River in 1754. Small quantities of petroleum were distilled in flasks, and large quantities were distilled in vats. A petroleum distillation plant with batch-operation vats, the first of its kind, was built by the Dubinin brothers, who were serfs, near the city of Mozdok in 1823. They produced 16 vedra (about 196.8 liters) of distilled petroleum from 40 vedra poured into the vats. The distillation of Groznyi petroleum was begun in 1837 at the plant of V. Shvetsov, a government franchiser. In that year, 1,000 poods (16.38 tons) of distilled petroleum were shipped to Moscow. A plant for distilling Baku petroleum was built in Bala-khany by N. I. Voskoboinikov; from 1837 to 1839 the plant refined 19.4 tons of petroleum. In 1859 the industrialists V. A. Kokorev, N. E. Tornau, and P. I. Gubonin began the construction of a plant in Surakhany for the production of “photogen” from Baku kir. Petroleum refining was begun at the plant in 1860, and alkaline-acidic photogen refining was introduced (the term “photogen” was later replaced by “kerosine”). In 1866, 1,600 tons of kerosine was produced at the refineries of former Baku Province. Three years later, there were 23 oil refineries in Baku; in 1873 there were 80 refineries capable of producing 16,350 tons of kerosine per year. In the early 1870’s the oil refineries increased the number and size of vats without significant changes in design. This technology did not meet the ever-increasing demand for petroleum products. In addition, the batch-operation vats did not provide for reliable separation of the oil into fractions, for improvement of the process for extracting kerosine and lubricating oils, or for an increase in their quality. D. I. Mendeleev pointed out the need for continuous distillation in 1863, when he visited A. V. Kokorev’s refinery in Surakhany. In 1873 the petroleum industrialist A. A. Tavrizov designed continuous-operation apparatus that was the prototype of the fractionating column. In 1883 at the Nobel’ brothers’ refinery in Baku, petroleum was distilled by the continuous-operation method in batteries of vats. Fractionating columns in the form of two cylinders, one enclosed in the other, were installed in the vats. A continuous distillation unit was proposed by V. G. Shukhov and F. A. Inchik in 1886 and was installed at the S. M. Shibaev refinery in Baku. The new installation made possible daily distillation of a quantity of petroleum equal to 27 times the cubic capacity of the apparatus, as opposed to four times the volume in a battery of vats and 1½ times in a batch-operation vat. The main technical principles incorporated in the design of this apparatus are used in present-day petroleum-distilling units. Original units for continuous distillation were developed by O. K. Lents, G. V. Alekseev, Iu. V. Lermontova, and other Russian engineers and chemists. Continuous-operation batteries, which replaced batch-operation vats, came into widespread use. In 1893, 15.7 percent of the vats in the petroleum-refining industry were of the continuous-operation type; by 1899 the proportion had risen to 60 percent. The main products of the petroleum-refining industry were kerosine and mazut. In 1899, kerosine accounted for 30–33 percent of total production; lubricating oils, 2–3 percent; and gasoline, 3 percent; the remainder was mazut. Petroleum distillation plants appeared in other countries in the 1840’s: J. Young began the distillation of petroleum at a plant in Great Britain in 1848; in 1849 a refinery was built in Pennsylvania (USA) by S. M. Kier. The alkali-acid petroleum-product treatment method was introduced at the refinery. The first refinery in France was built in Alsace by A. G. Hirn (1854); the refinery produced lubricating oils from petroleum and asphalt and used superheated steam in oil distillation (refining). In 1866, Young took out a patent for a method of producing kerosine from heavy crudes using distillation under pressure; the method came to be known as cracking. By 1869 the pressure during distillation in a laboratory installation had been increased to 3.7 × 105 newtons per sq m (about 3.8 technical atmospheres). From petroleum of various deposits Young produced 2.5–20.0 percent of the kerosine using conventional distillation and 28–60 percent of the kerosine using the cracking method. In prerevolutionary Russia, because of the low level of development of the automotive and aviation industries, the demand for gasoline was met entirely by straight-run gasoline distillation methods. By the turn of the 20th century, however, Russian scientists and engineers had studied in detail a refining process accompanied by decomposition of raw hydrocarbons under the effects of high temperature and pressure. In 1875, A. A. Letnii conducted experiments on the production of aromatic hydrocarbons through pyrolysis of petroleum. Letnii’s work culminated in the creation of an industrial installation at V. I. Ragozin’s Konstantinovskii Refinery. The aromatic hydrocarbons obtained from petroleum were necessary for the production of dyes used in the developing textile industry of that period. To the same end, the pyrolysis of oil and petroleum residues was studied by Iu. V. Lermontova, V. V. Markovnikov, K. I. Lisenko, G. V. Alekseev, and N. D. Zelinskii. Before refining, oil undergoes simultaneous desalting and dehydration. Electrical desalting plants at refineries are used for this purpose. During thorough mixing, the petroleum is washed with a small amount of fresh water with a demulsifying additive; the resulting emulsion is heated to 100°-140°C, and sometimes to 160°C, and is fed to continuous-operation electrical dehydra-tors. Under the effect of a high-voltage electric field (1.5–3.0 kilowatts per cm), the demulsifier, and heating, the emulsion is rapidly broken down, and the water, with the salts dissolved in it, is allowed to settle and is drawn off. After the electrical desalting, the moisture content in the oil is reduced to 0.05–0.20 percent and the chloride content is reduced to 0.5–5.0 mg per liter. After dehydration and desalting, many light crude oils undergo stabilization, which is the flashing-off of the propane-butane (and also, to some extent, pentane) hydrocarbon fractions. The removal of these fractions is necessary to decrease losses of valuable hydrocarbons during transportation and storage, and also to provide a constant vapor pressure of the oil fed to the distillation plants. The oil is stabilized in complex installations in conjunction with dehydration and desalting or in special plants with a column for extracting the propane-butane fraction. The propane-butane fraction obtained during the stabilization of the oil is a valuable raw material for the petrochemical industry. The main refining process (after dehydration, desalting, and stabilization) is distillation, in which such petroleum products as aviation or automotive gasolines, jet fuel, lamp kerosine, diesel fuel, and mazut are first extracted from the oil, depending on the purpose specified. Mazut is the raw material for the production of distillate oils, paraffin, and bitumens (asphalts) or for cracking; it may also be used as boiler fuel oil. The residue (concentrate or tar) after the oil distillates have been drawn off from the mazut is used for the production of residual oils or as a raw material for various degradative processes; after oxidation, it can be used as paving and construction asphalt or as a component of boiler fuel. The considerable growth in the consumption of petroleum products and the increasingly rigorous quality requirements have necessitated “secondary” refining of petroleum, which is associated with changes in the structure of the hydrocarbons of which it consists, and also with the production of functional derivatives containing oxygen, nitrogen, chlorine, and other elements. Secondary refining processes include thermal, thermal-contact, and catalytic cracking, as well as thermal and catalytic reforming, hydrocracking, platforming, alkylation, isomerization, dehydrocyclization, polymerization, destructive hy-drogenation, pyrolysis, and coking. Secondary refining yields raw materials for the manufacture of important products, such as synthetic rubbers, synthetic fibers, plastics, surface-active agents, detergents, plasticizers, additives, and dyes. The petroleum products obtained by straight-run distillation and secondary processes are treated by various physical and physicochemical methods to remove undesirable components (sulfurous, resinous, and oxygen-containing compounds, and also polycyclic aromatic hydrocarbons). The raw material required for the petrochemical industry is obtained from petroleum by means of (1) physical methods (distillation, extraction, crystallization, adsorption, and so on), and also carbamide and low-temperature deparaffination (methods by which individual hydrocarbons or classes of hydrocarbons are isolated from petroleum) or (2) secondary refining processes, which result in the production of hydrocarbons not present in the raw petroleum or present in small quantities (unsaturated and aromatic hydrocarbons). Of the paraffin (alkane) hydrocarbons, gaseous or low-boiling liquid hydrocarbons (methane, ethane, propane, butane and pentanes, and macromolecular hydrocarbons with ten to 20 hydrocarbon atoms per molecule) have become the most commonly used in the petrochemical industry. Among the naphthenic hydrocarbons, the most important raw material for the petrochemical industry is cyclohexane, and the most important aromatic hydrocarbons are benzene, toluene, xylenes, and ethylbenzene. Of the unsaturated hydrocarbons, ethylene, propylene, and acetylene are mainly used as raw materials for the petrochemical industry. Geologiia nefti: Spravochnik, vol. 1. Edited by N. A. Eremenko. Moscow, 1960. Eremenko, N. A. Geologiia nefti i gaza, 2nd ed. Moscow, 1968. Kartsev, A. A. Osnovy geokhimii nefti i gaza. Moscow, 1969. Vassoevich, N. B. “Istochnik nefti—biogennoe uglerodistoe veshchestvo.” Priroda, 1971, no. 3. Melik-Pashaev, V. S. Metodika razvedki neftianykh mestorozhdenii. Moscow, 1968. Teoreticheskie osnovy i metody poiskov i razvedki skoplenii nefti i gaza. Moscow, 1968. Poiskovye kriterii prognoza neftegazonosnosti. Leningrad, 1969. Lisichkin, S. M. Ocherki po istorii razvitiia otechestvennoi neftianoi promyshlennosti. Moscow-Leningrad, 1954. Proektirovanie razrabotki neftianykh mestorozhdenii. Moscow, 1962. Tekhnologiia i tekhnika dobychi nefti i gaza. Moscow, 1971. Krylov, A. P., and M. B. Nazaretov. “Tekhnicheskii progress v dobyche nefti i ego ro’ v razvitii neftianoi promyshlennosti.” Neftianoe kho-ziaistvo, 1973, no. 1. Lutoshkin, G. S. Sbor i podgotovka nefti, gaza i vody k transportu. Moscow, 1972. Surface Operations in Petroleum Production. Edited by G. V. Chilingar and C. M. Beeson. New York, 1969. Sergienko, S. R.Ocherk razvitiia khimii i pererabotki nefti. Moscow, 1955. Troshin, A. K. Istoriia neftianoi tekhniki v Rossii (XVII v.-vtoraia polovina XIX v.). Moscow, 1958. Kostrin, K. V. Pochemu neft’ nazyvaetsia neft’iu. Moscow, 1967. Redwood, B. Petroleum, 4th ed. vols. 1–3. London, 1922. Forbes, R. J. Bitumen and Petroleum in Antiquity. Leiden, 1936. Forbes, R. J. Studies in Early Petroleum History. Leiden, 1958. History of Petroleum Engineering. Edited by D. V. Carter. New York, 1961. Nametkin, S. S. Khimiia nefti. Moscow, 1955. Sokolov, V. A.,M. A. Bestuzhev, and T. V. Tikhomolova. Khimicheskii sostav neftei i prirodnykh gazov v sviazi s ikh proiskhozhdeniem. Moscow, 1972. Chemical Age of India, 1968, vol. 19, no. 10. Petroleum Processing Handbook. Edited by F. William [et al.]. New York, 1967. Emul’sii nefti s vodoi i melody ikh razrusheniia. Moscow, 1967. Kaspar’iants, K. S. Promyslovaia podgotovka nefti. Moscow, 1966. Erikh, V. N. Khimiia nefti i gaza, 2nd ed. Leningrad, 1969.
International Petroleum Encyclopedia. Tulsa, 1973. 05% Silwet L-77 to petroleum oil 435, Prescription Treatment Ultra-fine oil, or Prescription Treatment Ultra-pure oil significantly increased the efficacy of these oils against the Boisduval scale and the flat mite. Although petroleum oil has been the ingredient of choice because of economic and performance characteristics, alternative products are beginning to compete with traditional lubricants in several niche segments, including hydraulic fluids, two-cycle engine oils and bar chain oils. A source at the Government's Board of Commissioners for Pertamina said that in its position as operator with all consequences (meeting the domestic demand for petroleum oil without thinking of profit), it was impossible for the company to face the challenges as an oil company in the free trade era. However, they did not evaluate toxicity of petroleum oil in combination with Silwet L-77 or Kinetic to psyllid immatures and adults and did not evaluate the effects of these products on any natural enemies of D.
The program initially was funded by mitigation funds paid after a British Petroleum oil spill in Huntington Beach and from the San Onofre nuclear power plant. DALLAS -- Pioneer Natural Resources Company (NYSE:PXD) ("Pioneer" or "the Company") today announced that the Company closed its previously announced sale of its South Africa business to The Petroleum Oil and Gas Corporation of South Africa (SOC) Ltd.
January-August, Jiangsu petroleum oil products to achieve sales of 9. China : Potential expansion of the terminal pin incremental oil sales zoom "Jiangsu effect"
Martin, president and chief executive officer of Occidental Petroleum Oil and Gas Corp.
HOUSTON -- Officials from Latino Hotel Association (LHA), the global organization dedicated to expanding Latino ownership, leadership, and commerce in the hotel industry, today announced a strategic partnership with the Buzbee Law Firm, an organization that represents plaintiffs' interests in a number of fields, including a specialty group created to handle British Petroleum oil spill claims. After fierce competition written part of, oil Anhui, Shanxi and Hunan petroleum oil group won the top three provinces of Anhui region oil Chen, Han Jie Hunan petroleum, petroleum Liangxiao Guo Shanxi, Zhejiang Sun Jiahua petroleum, petroleum Xuxing Bo Heilongjiang, north stars companies Zhaihao Dong and other six players won the gold medal, also named its corresponding silver and bronze medals six players each. In addition, SLG is exploring the acquisition of petroleum oil tank trailers. China Petrochemical News Network reporter Gao Jun Liu Jiangbo reported: During the Yanshan petrochemical plant overhaul, efforts to protect the capital Beijing Petroleum oil supply, the current oil depots, gas stations safe and orderly operation, safety and quality of the number of accidents occurred.